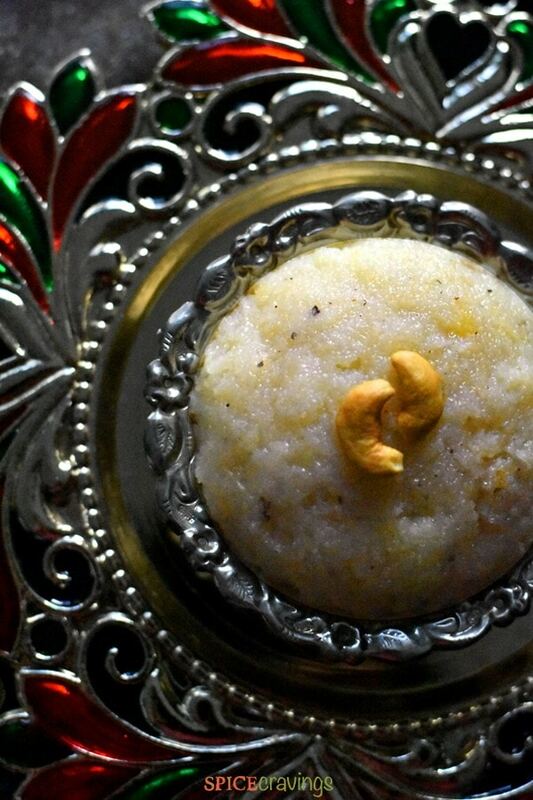 Sooji Sheera or Semolina Indian Pudding is a delicious Indian dessert that can be made in minutes. 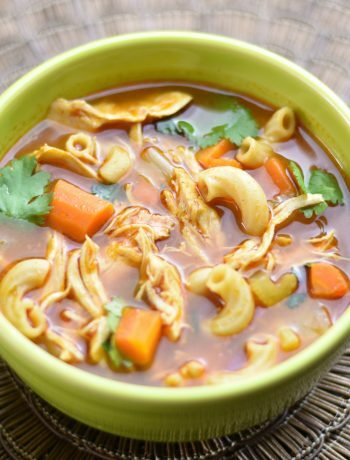 Here is an easy recipe for this simple dish using the stovetop or Instant Pot. 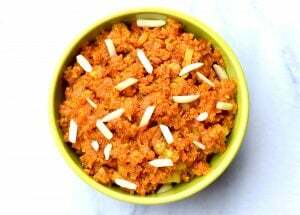 It has many variants all over India like Sooji Halwa, Rava Sheera, Rava Kesari and more. 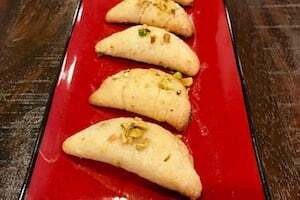 This is one of the few Indian desserts or Indian sweets that can be whipped up with pantry ingredients, without any advance preparation. 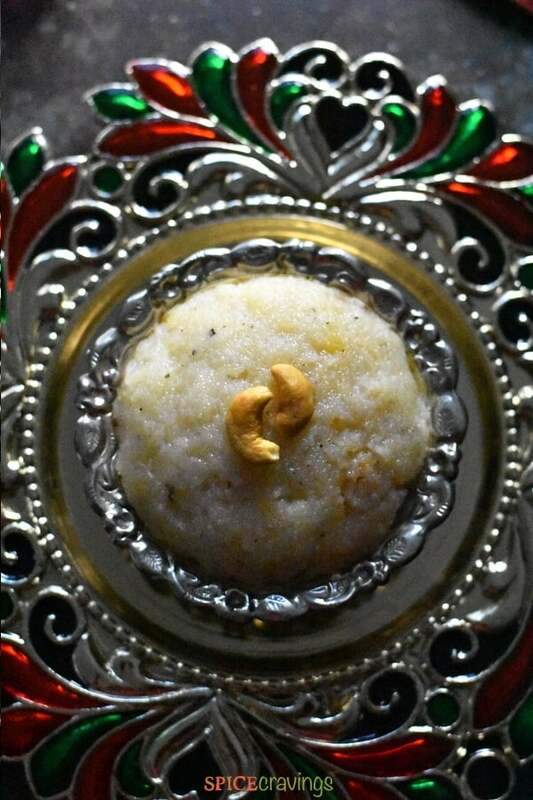 Sooji sheera is traditionally served on many festive occasions and Puja (prayer ceremonies) as Prasad (religious offering, consumed after completion of ceremonies). It is also a popular snack for toddlers, because of its soft pudding or porridge-like consistency. In my variation of this classic, I add a few tablespoons of almond meal (or almond flour) to the recipe. 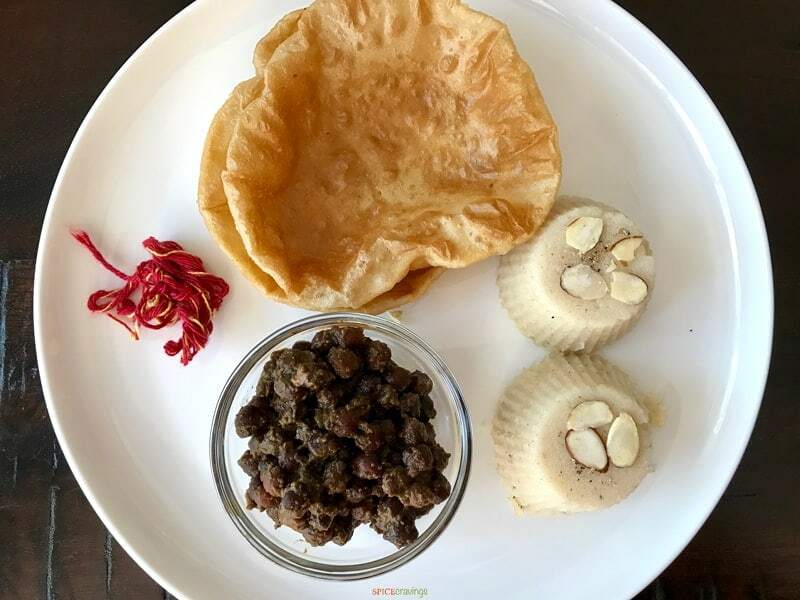 It adds a creamy rich taste of almonds and bumps up the protein in this dish, making it healthier for my kids. 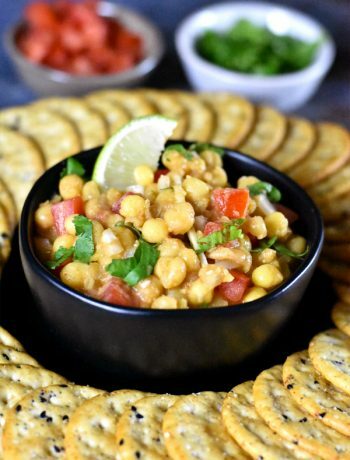 It is extremely easy to customize this recipe to your taste. 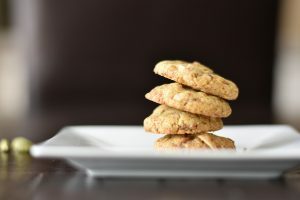 I like using a combination of Ghee and unsalted butter for this recipe, but you can stick to one if you prefer it that way. 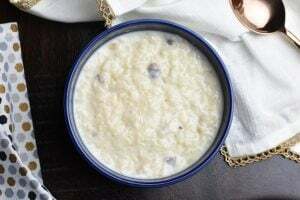 I make this Sooji Sheera using a half-and-half mix of milk and water. 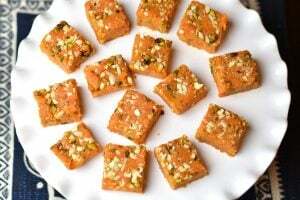 You could make the sooji sheera with only milk or only water too. 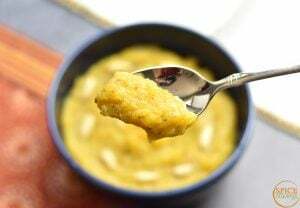 I add saffron to the milk and water mix before warming it so that the saffron releases its flavor and color to the sheera. 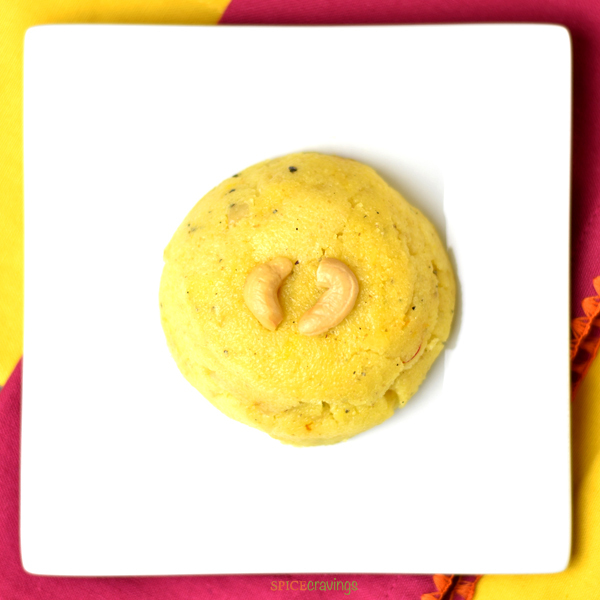 The saffron is optional, this variation is popularly known as Rava Kesari in southern India. To make this a fun recipe for the kids, I sometimes set it in silicone cupcake molds, which shapes them like a cupcake. First, I make the Sheera and turn off the heat when it’s at a semi-dry consistency. Then, I pour it in silicone baking cups, even it out with the back of a spoon, and let it set for a few hours. For plating, I simply invert the silicone molds on to a plate and the semolina cakes just slide off. I garnish it with sliced almonds and crushed cardamom. My kids love this presentation! It looks like a cupcake plus its bite size makes it a perfect snack. My kids love it for breakfast too! I get this question a from a lot of friends and readers. I tried pressure cooking this recipe a few times, making minor adjustments each time, before I finalized this recipe. This is one of those recipes, where I make it in the Instant Pot, only if I’m making a larger quantity. Otherwise, the stove-top recipe is much quicker in my opinion. For Pressure cooking, for every 1/2 cup of semolina, I add 1.5-2 cups of warm liquid, depending on how you like the end result. This liquid can be water or a mix of water and milk. 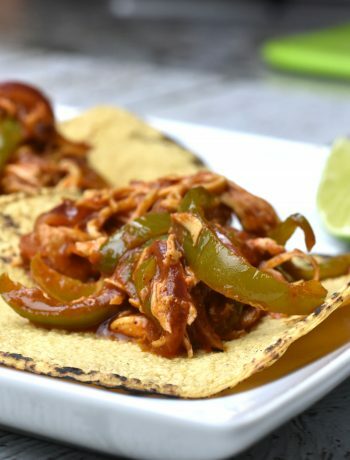 You can make it entirely on the SAUTE setting (high) in Instant Pot, using the existing recipe listed in the recipe card. Step 1: Heat Milk/Water → Heat milk and water mix (or your preferred liquid), and saffron in the microwave for 3 minutes. Keep aside. Step 2: Saute → Heat ghee on SAUTE. Add semolina (sooji/suji) and saute till it smells fragrant. The saute time depends on personal preference. I stop sautéing it after 6-7 minutes. That time is enough to lightly roast the semolina while maintaining the milky-white color of the halwa. That’s how my kids like it. I also add chopped nuts with semolina and lightly roast those. 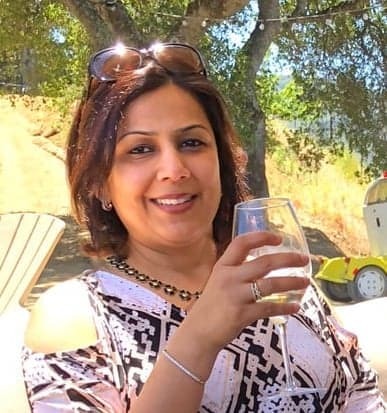 My mom roasts it till the semolina turns golden brown, about 10-12 minutes. So, roast according to preference here. If you are roasting for a longer time, stir every 30 seconds towards the end as it can burn quickly at that stage. Turn OFF Saute. Step 3: Add Sugar → Add sugar and mix well. Step 4: Pressure Cook → Add the saffron milk mixture to the pot, and whisk well to prevent any lumps. Close the lid. Set the vent to ‘sealing’ mode and pressure cook for 4 minutes on high pressure. Step 5: Garnish → Wait 5 minutes before releasing pressure (NPR 5). To release pressure manually (QR), turn the knob from sealing to venting position in Duo, press the pressure valve down in Ultra. Once the pin drops, open the lid. Add crushed cardamom and mix well. Garnish with chopped nuts and serve warm! Enjoy! 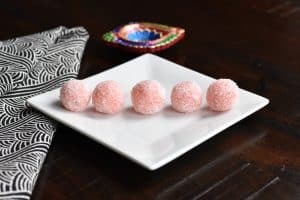 Here are some other Indian dessert recipes that I love to make and my family really enjoys. 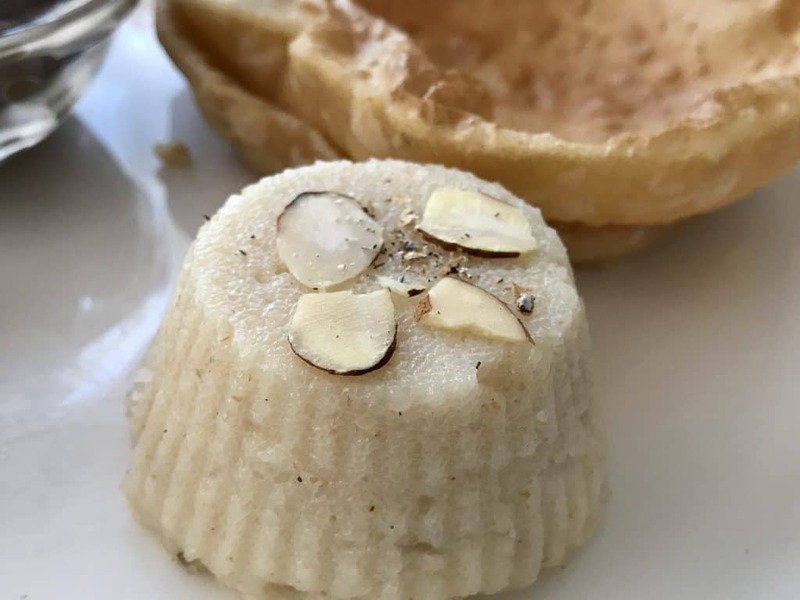 Sooji Sheera is an Indian dessert made by pan-roasting semolina and cooking it with milk and sugar. I add a few tablespoons of almond meal to boost the protein content and infuse a flavor of almond in this dessert. Prep: If using nuts, chop them coarsely. Warm milk, water and saffron, together in the microwave for 2 minutes. Keep aside. Add ghee/butter in a sauce pan and melt on medium heat for 20-30 seconds. Then, add your choice of chopped nuts and raisins and sauté for 1 minute. Add Sooji (and almond meal) and sauté for 5 minutes on medium flame, this is to cook away the rawness of semolina (sooji). 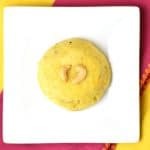 Add the warm milk-water-saffron mix and stir continuously with a whisk or wooden spoon to avoid any lumps from forming. When the mix reaches a semi-liquid consistency, add sugar and stir till sooji cooks off to a thick pudding-like consistency. Turn off the heat and add the cardamom powder and stir. Serve warm or cold. 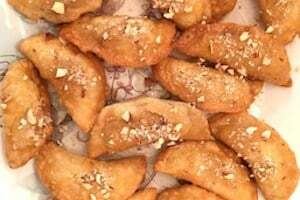 You can choose to make this recipe without any nuts if you wish, it still turns out delicious! When you add warm liquid to the pan, it splashes, so use a deep sauce pan and a long whisk to be safe.